Make it possible for universities and colleges to offer advanced STEM courses and other programming and services for all students on campus. But the United States is at risk of losing these contributions without comprehensive immigration reform and other policy changes. While the number of internationally mobile students has doubled over the last decade, the United States has lost nearly 10% of its market share of international students due to increased competition from other countries with friendlier immigration policies. NAFSA: Association of International Educators has long advocated for policy changes to end this decline. While there have been some incremental successes over the years, many of NAFSA’s recommendations still remain critical to increasing the numbers of talented international students in the United States. Some of these changes require congressional action, while others should be implemented at the executive or agency levels. Improve management and coordination within the Department of Homeland Security. 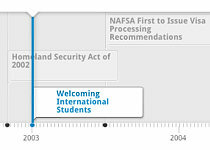 NAFSA's international students and scholars advocacy has focused on advancing policies that support an open and welcoming environment for ISS. Review these successes on this interactive timeline.